Several Indonesian ceramic producers have reportedly stopped production as stocks of ceramics are piling up at their warehouses. Normally, in the good old days when there existed high demand for ceramic products (due to Indonesia's booming property sector), stocks of ceramics lasted for only two weeks. 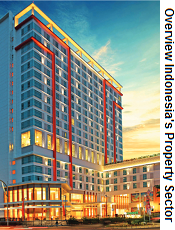 Now, however, amid sluggish growth of Indonesia's property sector, the existing stocks of ceramics are estimated to cover at least three months. Both sales and production of ceramic products in Indonesia have been on the decline. Per June 2016, Indonesia's ceramic manufacturers produced a total of 160-170 square meters of ceramic tiles, down 5 percent from production in the same period one year earlier. This decline is attributed to the slowdown in Indonesia's property sector, where the majority of ceramic demand lies. Elisa Sinaga, Chairman of the Indonesian Ceramic Industry Association (ASAKI), stated that at the start of the year he expected that the situation would improve for ceramic sales as there were high hopes that Indonesia's property sector would rebound supported by improving purchasing power, lower interest rates and Indonesia's tax amnesty program. However, matters have still not turned 'normal'. Indonesia's GDP growth was disappointing in the first quarter at 4.92 percent (y/y) and this undermines property sales and property development in Southeast Asia's largest economy. As such, the decline in ceramic sales continued. Indonesia's tax amnesty program, which is expected to lead to capital inflows into Indonesia's property sector, was only approved by Indonesia's House of Representatives (DPR) in late June and therefore could not boost ceramic demand in the first half of 2016. Although it remains uncertain whether the amnesty program will be a success, it may still be able to boost the nation's property sector (and thus ceramic demand) in the second half of the year. Although state income through the amnesty program has been disappointing in the first couple of weeks since its launch in mid-July, ASAKI Chairman Sinaga remains optimistic that the program will manage to boost Indonesia's ceramic industry in the last quarter of 2016 or the start of 2017 (the tax amnesty program runs until 31 March 2017). Do you think that Indonesia's tax amnesty program will be a success? Ceramic companies still sell their ceramic products (despite the production process having been curbed or stopped altogether by several ceramic companies) as they have plenty of stockpiles. However, this situation should not last too long, Sinaga says, as it leads to layoffs. Meanwhile, Indonesian ceramic manufacturers remain plagued by high production costs, particularly due to costly energy prices (gas). Although the crude oil prices have fallen drastically over the past year, gas prices have not dropped accordingly. Given that gas accounts for about 30 to 40 percent of ceramics' production costs, it constitutes a major burden. In one of the economic policy packages that was released by the Indonesian government, it promised to lower gas prices for several industries, including the ceramic industry. However, these industries have been waiting for the government to take action. According to an official of Indonesia's Industry Ministry, these industries will be able to enjoy lower gas prices starting from the second half of August 2016. Sinaga said Indonesian ceramic producers currently pay an average USD $9.1 per mmbtu (million metric British thermal units), more than double the price that foreign counterparts pay in Singapore, Thailand and India.